Bureau of Shipping, Sturgeon Bay, Wis., and Comdr. York City area, the barge will be suitable for carrying grade B petroleum products and lower, including heavy fuel oil. Ten cargo tanks with two abreast and five in length will have a volumetric capacity of 103,500 barrels. Three main cargo deep-well pumps will be on deck. Each pump will be powered by a GM Detroit V16 Diesel engine developing 480 horsepower. These three pumps will each have a capacity of approxi- mately 4,200 gpm or 6,000 barrels'hour. Corp. Delivery of the 396-foot tank barge will take place in the summer of 1980. The Great Congress St. & Atlantic Steam- ship Company, Ltd., Boston, Mass., has signed a contract with Blount Marine Cor- poration of Warren, R.I., for construction of a 75-foot steam launch of traditional turn-of-the-century lines. The vessel is to be a classic single-deck steam launch with a 17-foot beam and a 4-foot draft. The steel hull will carry a vintage mahogany superstructure incorpo- rating a pilothouse and glassed-in engine room, making the engine and boiler visible to passengers. Coast Guard and will accommodate 125 pas- sengers on old-fashioned rim seating under a canopy. Careful attention to detail above the waterline will produce a faithful re- creation of the type of passenger launch that plied Boston Harbor 100 years ago. It will produce about 80 hp at 250 rpm under 180 psi. All auxiliaries will be steam-driven as well from a modern marine boiler designed specifically for the boat. Ajax, owned and operated by John Clement, one of New England's senior marine steam- ers. Prof. Jens Holm of the Webb Institute is the steam consultant for the project. Blount Marine is one of the foremost de- signers and builders of passenger vessels in the United States. They recently chris- tened the New Shoreham, an 80-passenger cruise ship of 150 feet. Delivery of the steamboat and commence- ment of service in Boston Harbor is planned for May of 1980. In 2 Voyages-After That, It's Pure Profit! At a typical vessel operating cost of $20,000 per day or $833 per hour, less than 16 hours saved through improved, precise navigation could pay for a Magnavox Satellite Navigator in full! Magnavox has produced over 2,000 Satellite Navigators with over 8 million hours of actual operation. An impressive record! For support that matches Magnavox reliability, Nav-Com is readyto respond to yourneeds with prompt, efficient, and competent service. 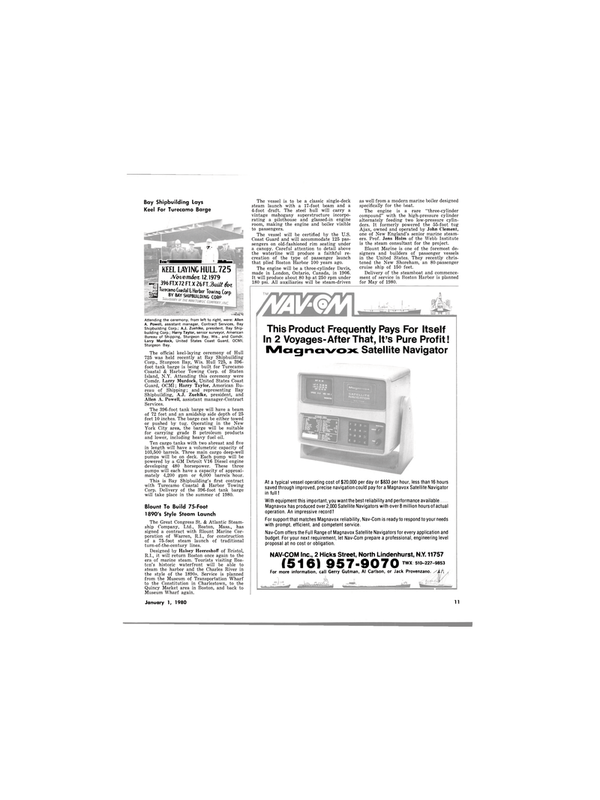 Nav-Com offers the Full Range of Magnavox Satellite Navigators for every application and budget. For your next requirement, let Nav-Com prepare a professional, engineering level proposal at no cost or obligation.